Running slower, but still good at drinking beer. Pints for Paws, a beer festival to support of Berkeley Humane on June 7th isn't your typical beer festival. Oh sure, they'll be over twenty of some of the finest Bay Area breweries pouring, local food and live music like most beer festivals. Unlike most beer festivals, 100% of the proceeds go directly to the charity. Most people aren't aware that few charity beer festivals operate this way. Most pay a portion of their revenue to a professional organizer once all the expenses to run the festival are paid. An organizer usually takes 5-10% of the festival revenue, but sometimes the percentage can be as high as 35%. Pints for Paws festival organizer Ashley Routson wanted to do things differently. Routson, also known as The Beer Wench, has been enthusiastically bouncing around the Bay Area brewing scene for many years in many roles and is currently the Director of Awesomeness for Bison Brewing. She also owns a rescue dog and is passionate about the Humane Society's mission to provide care for homeless animals. Since every thousand dollars Berkeley Human raises allows them to save an additional homeless animal, she wanted to make sure the festival proceeds would save as many animals as possible rather than ending up in an organizer's pocket. As Routson explains, "With this particular event, the charity is the only one touching the money. And Berkeley Humane is very transparent with how that money will be used. The math is simple, the message is simple. $1,000 = 1 animal life. Drink Beer. Save Animals." 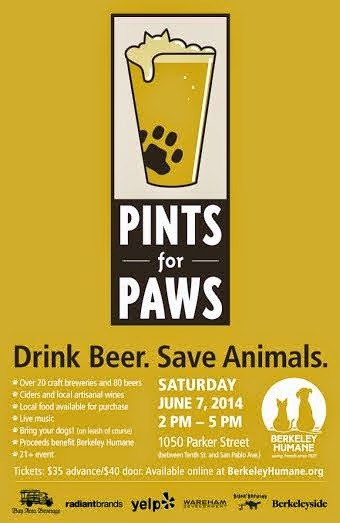 So go to Pints for Paws this June 7th, enjoy some great beers, and be confident knowing all the proceeds are going directly to Berkeley Humane. For more information and to buy tickets, go to http://berkeleyhumane.org/pintsforpaws. The Session #67 Announcement: How Many Breweries in 2017? I've belonged to the strange tribe of runners for over thirty years and had a few beers along the way. Mastering the art and science of grilling is my latest passion. Here's where I ramble on about beer, grilling and running, mostly in that order. Can Mavericks Brewing Ride the Wave of Low Alcohol Craft Beer?